COST: £1,131 INCLUDES ALL B&B accommodation, Transport, FERRIES and Mountain Leader guide BUT EXCLUDES FOOD (other than breakfasts) AND DRINK. Discounts for groups of 3 or more. IF YOU LIKE EXPANSIVE HORIZONS AND ISOLATED SHORELINES OF WHITE SANDS BACKED BY WILD HILLS, THEN THIS IS THE TOUR FOR YOU. 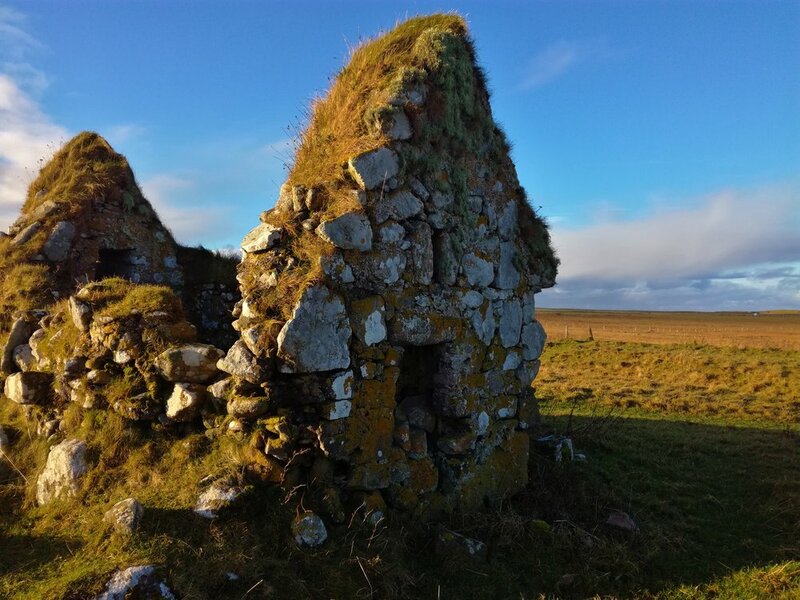 THIS ITINERARY TAKES IN THE FULL LENGTH OF THE OUTER HEBRIDES with local walks to fine sandy beaches and atmospheric ruins. ENCOUNTERS WITH THE GENTLY SPOKEN GAELIC LOCALS MAKES YOU AWARE THAT YOU’VE ARRIVED IN A DIFFERENT CULTURE. THESE REMOTE ISLANDS OUT ON THE EXTREME EDGE BRING AN OTHER-WORLDLY FEEL. YOU SEEM TO SEE EVERYTHING THROUGH A DIFFERENT LENS AS THE LIGHT IS SO SPECIAL UP IN THESE NORTHERN LATITUDES, which together with THE ABSENCE OF TREES AND VAST SEA AND SKY SCAPES, BRING A GREAT AWARENESS OF UNHINDERED OPENNESS. COST: £1,131 per person based on two sharing a room and subject to availability. Price includes all transport, ferrries and B&B accommodation but excludes food (other than breakfasts) and drink. Single supplements: £1,258 for the whole package. A day of travel to this distant region, but a leisurely one for a large part, as we cruise across the Hebridean Sea, past many islands, including the Isle of Mull and the jutting peninsula of Ardnamurchan. Pickup in Glasgow, drive to Oban along Loch Lomond, passing the dramatic hills of Ben Lui and Ben Cruachan to the picturesque port of Oban. Afternoon sea voyage up the splendid Sound of Mull, past Ardnamurchan point and onto Castlebay on Barra. Take up accommodation and meal out. Evening walk from town out along a headland to overlook an island – chance to see seals and other wildlife. Grading: Easy along roads and paths. Distance: 3kms. Height gained: 15m. Drive across the causeway to Vatersay and walk the tombolo - an isthmus with a double sided sandy beach to view the end of the uninhabited island chain including Mingulay. Grading: Moderate walking cross country over short grass and bog, then finally on the sand. Distance: 4kms. Height: 105m. Drive north around the NW coast of Barra. View the ‘low-tide’ landing strip on the sands before completing the island tour. 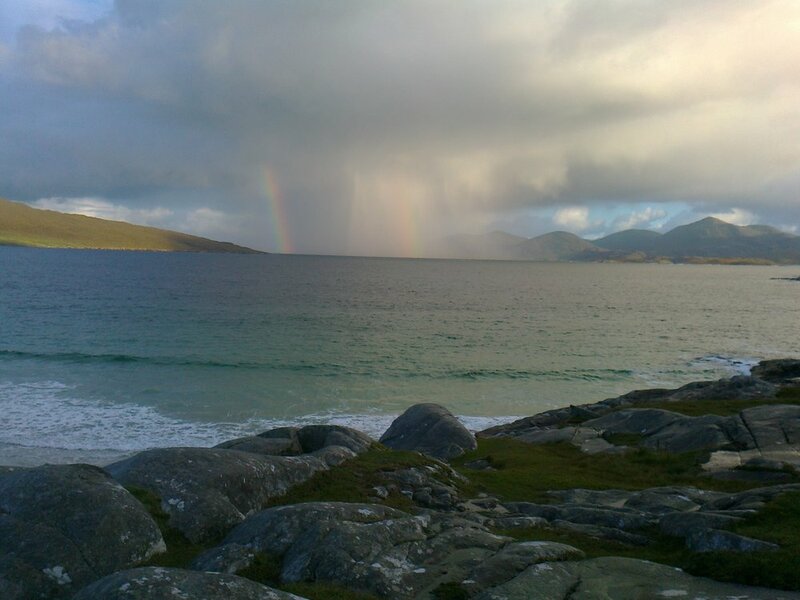 Either climb to the island’s highest summit or walk a coastal section, both near Castlebay. Visit the pub overlooking the scene of the sinking of a merchant vessel full of a cargo of Whisky – the inspiration of the film ‘Whisky Galore’. Walk to a Neolithic burial cairn and a stone circle. Grading: Easy but wet under foot. Distance: 3.25km. Height gained: 90m. Take up accommodation for a further two nights. A day of less road travel as we take more to foot. Option to ascend Eaval, North Uist’s highest peak at 347m, but in a class of its own for the views. Distance: 10.5kms Height: 375m Grade: difficult over pathless and rocky and boggy terrain. The walk is tide and weather dependent. Board the ferry for circuitous passage around the many skerries of the shallows of the Sound of Harris. Visit the medieval church at Rodel with some Celtic cross slabs. Returning along the long coastal road to take the pass over the Hills of Harris under the shadow of its largest peak, Clisham. Take up a 2 night accommodation in the Callanish area, visiting the famous Neolithic standing stones in a cruciform shape. Head for Callanish to see the ancient stones arranged in a cruciform shape. Travel to Stornoway over the expansive moors of Lewis for the afternoon ferry. Voyage across The Minch to Ullapool. Late evening arrival in Glasgow.